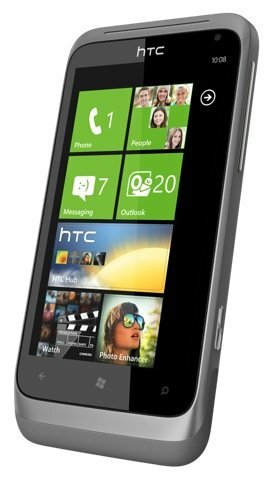 I have been contemplating new phones for a few months and have finally taken the plunge and aquired an HTC Radar running Windows Phone 7.5 (Mango). The Windows Phone 7.5 interface is very slick and is extremely responsive, this could be a combination of the restrictions Microsoft have put on the OS and the excellent hardware platform supplied by HTC. The “live tiles” are a nice feature and provide a good intuitive interface which is very user friendly. You are informed of how many calls you have missed, how many e-mail and text messages you have received. Setting up the phone to a Windows Live account is mandatory, this is easily done either with a new Windows Live account or with an existing account. This then gives you access to Windows Live Email and Skydrive (25GB of cloud storage!). You then get all your contacts and calendar items synced between your phone and live.com. For corporate users you can then connect to your Exchange server and receive full push e-mail, contact sync and calendar updates. There are a good set of apps already available through the Marketplace. You can publish quickly to the main Social Network Sites – Twitter, Facebook, Linkedin and of course Windows Live. You are unable to add additional storage. You cannot access the battery. You must use Zune or Cloud Services to add or copy content to or from your phone (just like Itunes!). The development of Apps for the marketplace needs to speed up. There is a weird set of “profile” options, silent or ring (with vibrate), silent or ring (without vibrate). You cannot have custom text / email / appointment tones. No Free Sat-Nav (my Desire had the excellent Google Navigator). So all in all, do I like it? I have to say I have not yet disposed of my Desire but I am steadily growing to like the Radar. There are some other good features, through the My Windows Phone Microsoft site you can Find, Ring, Lock or Erase your phone. Handy if you lose it (or if you mislay it in your house and need to ring it to find it!). Also within the lock function you can specify a message and an unlock pin number. Worthy of a mention is that the phone is also good for making actual phonecalls! I am going to stick with it for the time being and hope someone writes an app to silent and turn of vibrate at scheduled times!